BACKGROUND AND PURPOSE: Lack of cerebral circulation is an important confirmatory test for brain death (BD). Conventional angiography remains the standard imaging method, but CT angiography (CTA) is emerging as an alternative. France accepts BD diagnoses relying on a score based on lack of opacification of 7 intracerebral vessels in CTA images. The purpose of this study was to validate the efficiency of this score and to evaluate the sensitivity of a novel 4-point CTA score in confirming BD. MATERIALS AND METHODS: A prospective multicentric study was conducted during 12 months with 105 patients referred for CTA to confirm a clinical diagnosis of BD. Clinical data were recorded. 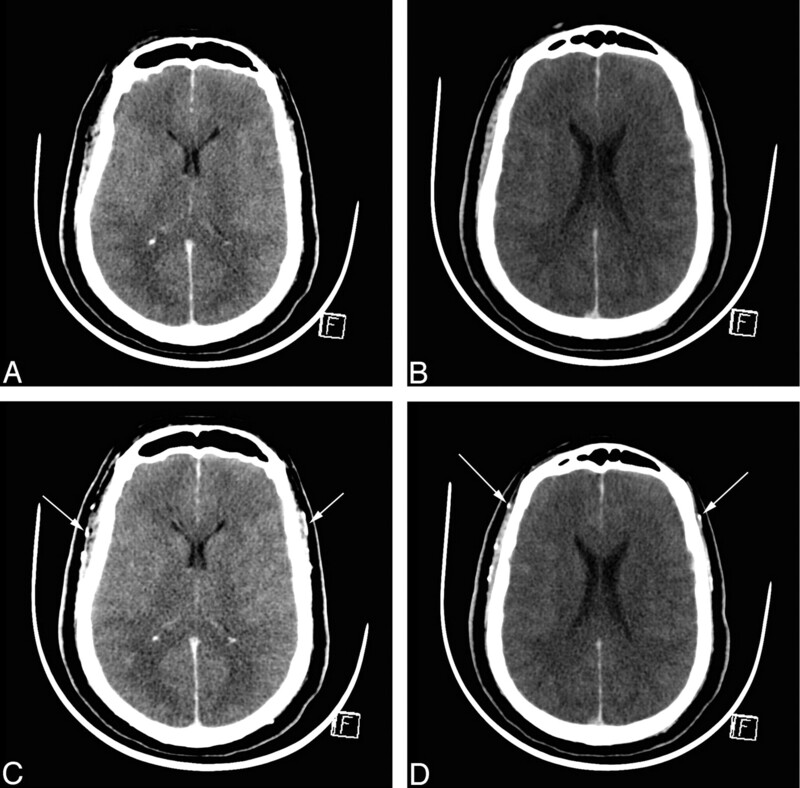 CTA images were interpreted first by local radiologists at the referent center, resulting in a 7-point score based on lack of opacification of the pericallosal and cortical segments of the middle cerebral arteries (MCAs), internal cerebral veins (ICVs), and 1 great cerebral vein per patient and, second, by a consensus panel of 3 expert radiologists, blinded to the initial scores, resulting in novel 4-point scores based on the lack of opacification of the cortical segments of the MCAs and ICVs. RESULTS: Injection of contrast medium did not alter renal function. With the initial 7-point score, sensitivity was 62.8%. With the simplified 4-point score, sensitivity was 85.7% and specificity was 100%. Opacification of ICVs was absent in 98.1% of patients. CONCLUSIONS: Lack of opacification in the cortical segments of the MCAs and internal veins in CTA is efficient and reliable for confirming BD. The clinical criteria of brain death (BD), deep coma and absence of brain stem reflexes, may be difficult to evaluate in patients in the intensive care unit (ICU) in the presence of central nervous system (CNS) depressants.1 Many countries require a clinical diagnosis of BD to be confirmed by a demonstration of lack of brain cerebral function or circulation. The methods accepted for such demonstrations include electroencephalography (EEG), transcranial Doppler (TCD), and conventional angiography. Legal requirements vary by country. For example, France requires 2 rounds of EEG with an interval of 4 hours or conventional angiography.2–4 Although conventional angiography remains the reference standard method for demonstrating lack of cerebral circulation, CT angiography (CTA) is emerging as a viable alternative. CTA confers a number of advantages: lower invasiveness, wider availability, lower operator dependence, greater rapidity, and ability to evaluate patients in the presence of CNS depressants. The efficiency of CTA for BD diagnosis was first demonstrated in a study by Dupas et al,5 in which BD diagnosis relied on a score based on lack of opacification of 7 intracerebral vessels: the pericallosal arteries, cortical segments of the (MCA) arteries, internal cerebral veins (ICVs), and 1 great cerebral vein (GCV) per patient. On the basis of that study, France accepted the 7-point CTA score for BD diagnosis in 1998. Other studies have since demonstrated the persistence of visualization of intracerebral vessels in BD. Dupas et al studied a population of 14 BD patients and 11 healthy controls, but larger studies are needed to validate their findings further. This study aimed to validate the sensitivity of a simplified 4-point CTA score based on lack of opacification of the cortical segments of the MCAs and the ICVs in confirming the clinical diagnosis of BD. We prospectively evaluated 105 patients diagnosed with clinical BD at 6 centers from January to December 2005. All patients in the ICU with clinical BD were considered eligible. For 12 months, the ICU referred 105 BD patients for confirmatory CTA (47 women, 58 men; mean age, 49.2 years; age range, 16–76 years). Initial causes of coma were head trauma (n = 36); cerebral hemorrhage (n = 45), with 48% from aneurysm rupture; cerebral stroke (n = 4); anoxia (n = 11); and cerebral hypertension (n = 9). All clinical criteria for BD were present in all 105 patients before CTA, including a positive apnea test (duration, 10–15 minutes; 15-minute preoxygenation with 100% oxygen; oxygenation catheter at the trachea level at a rate of 6 L/min; a partial pressure of carbon dioxide value of 60 mm Hg or higher confirmed apnea). Demographic data, initial causes, and the following were recorded for all patients: the time between initial coma and clinical BD diagnosis; the use of vasoactive agents and resuscitation fluids, arterial pressure, renal function before and after CTA, and organ harvest. Multidetector CT scans were acquired following the protocol outlined by Dupas et al.5 After a lateral topography, 3 similar acquisitions were planned starting at the C1-C2 level to the convexity. The first phase was without injection of contrast. A nonionic contrast medium(120 mL; concentration >300 mg/mL) was injected through an antecubital vein at a rate of 3 mL/s by using a power injector and an 18-gauge catheter. The second and third scans were then acquired, starting 20 and 60 seconds after the contrast medium injection commenced. The same geometric parameters were used to allow further subtractions. Images were acquired with a section thickness of 1 mm (pitch, 0.5–1); scanning parameters were 120 kV, 300 mAs, 200-mm FOV, and 512 × 512 matrix. Contiguous axial images (5 mm) were then reconstructed. Subtractions of the precontrast and postcontrast series and sagittal reformations were performed as needed. CTA images were first interpreted by local radiologists at the 6 referent centers, to confirm clinical BD; then all examinations were reviewed by 3 expert radiologists blinded to the results of the first interpretation to assess lack of opacification and resolve discrepant initial interpretations. Opacification of superficial temporal arteries was assessed on the second phase at 20 seconds to confirm the correct injection of contrast medium. The third phase, at 60 seconds, was used to evaluate opacification of the following vessels: pericallosal arteries, cortical segments of the MCAs, right and left ICVs, and GCV (Fig 1). Following Dupas et al,5 a point was given for each vessel without opacification, resulting in “lack of opacification” scores of between 0 and 7. Opacification of the basilar artery (BA) was also recorded for all patients. The same dataset was then used to construct a novel 4-point CTA score based on the lack of opacification of cortical segments of the MCAs and the 2 ICVs. CTA: normal aspect in a healthy adult. A, All intracranial vessels, pericallosal arteries, MCAs, ICVs (arrows), straight sinus, and superior sagittal sinus, are opacified. B, Cortical arteries are opacified (arrows). In both, superficial temporal arteries are visible. The 7-point CTA scores were used for diagnosing BD, scores of 7 indicating BD (Fig 2). Patients with scores <7 were given a complementary examination to assess BD: delayed CTA (n = 10 patients), conventional angiography (n = 10), or 2 EEGs (n = 12). Data were missing for 7 patients. CTA in BD before and 60 seconds after contrast medium injection. A and B, Unenhanced CT sections. C and D, Corresponding CT sections with identical window settings 60 seconds after contrast medium injection, demonstrating cerebral CT silence: absence of visualization of ICVs and cortical segments of the MCAs. Both superficial temporal arteries are opacified, indicating that contrast medium has been correctly injected (arrows). The mean interval between the initial coma and absence of brain stem reflexes and apnea test was 67 hours and 87 hours, respectively. During their ICU stay, 96.2% of patients were administered vasopressive agents (adrenalin for 93.3%). At the time of CTA, the mean minimal systolic arterial pressure was 114 ± 29.19 mm Hg, 92.4% of patients had been treated with catecholamine, and 42.8% had undergone fluid resuscitation. The respective mean creatinemia before and after CTA was 101.1 and 89 μmol/L; and the respective mean uremia was 6.6 and 5.79 μmol/L, indicating that the injection of contrast medium did not alter renal function. Confirmed BD led to organ harvesting in 75 patients. Residual vessel opacification was determined by visual analysis, by using a comparison between unenhanced and enhanced CT scans. The superficial temporal arteries were opacified at 20 seconds in all patients, confirming proper injection of the contrast medium; and they were still visualized at 60 seconds. Sixty-six patients had CTA scores of 7 (sensitivity 62.8%) with a lack of opacification of pericallosal arteries, cortical segments of the MCAs, ICVs, and GCV; 16.2% (n = 17) of patients had scores of 6 mainly due to persistent pericallosal artery visualization. Lower scores of 5 (n = 7), 4 (n = 8), 3 (n = 5), 2 (n = 1), and 1 (n = 1) were also recorded, mainly due to, first, the pericallosal arteries and, second, the cortical segments of the MCAs. ICV opacification was absent in 103 (98.1%) patients. For the 2 patients with 1 residual opacified ICV, the score was ≤2. For 1 patient, the only opacified vessels were the GCV and the BA (Table 1). Eighty-five and seven tenths percent of patients had a score of four; 7.6% had scores of three; 4.8% had scores of 2, and 1.9% had a score of 1 (Table 2). The complementary examinations to confirm BD diagnoses based on the 7-point CTA score were as follows: The mean interval for the second CTA was 99 ± 68 hours; the second CTA score was 7 for 8 of the 10 patients and 6 and 4 for the other 2. In all cases, conventional angiography and EEGs confirmed brain death. Data were missing for 7 patients. A study of 43 patients by Combes et al11 found that the 7-point score had a sensitivity of 69.7% compared with conventional angiography; 76.9% of divergent cases were due to opacification of the anterior cerebral arteries (in 38.5% of the patients, they were the only opacified vessels). There was no opacification of BAs. With the novel 4-point CTA score, which does not include those vessels, the sensitivity would have been 81.4%. In the present study, 37.1% of patients had opacified residual vessels. A single persistent pericallosal artery opacification was present in 16 of the 17 patients with a CTA score of 6; both arteries were opacified in all 7 patients with a score of 5. With the new 4-point CTA score, sensitivity was 85.7%, obviating new examinations. Nine of 11 patients who had a second CTA (mean interval, 99 hours) had a score of 7. Pericallosal arteries were still opacified for 2 patients. One had an opacified cortical artery, but no venous return was noted. Leclerc et al12 found similar results; and on the basis of their data, the sensitivity of the 4-point CTA score would have been 93.3%. Together with the present findings, this suggests that the absence of ICVs and bilateral cortical branches of the MCAs constitutes the best criterion of BD diagnosis by using CTA. The absence of the ICV also appears to be the most sensitive and earliest sign. Both internal veins were absent in 98.1% of the patients. Quesnel et al13 found similar results; 85.7% of their patients lacked deep venous return. In the present study, 2 patients had 1 residual opacified ICV, but the score was low (≤2). One patient had opacification of only the GCV, leading to a score of 6, but the BA was opacified at 20 and 60 seconds. This was previously described by Braun et al14 in intravenous angiography with residual flow in the vertebrobasilar system, despite clinical BD. These findings suggest that it was judicial to exclude the GCV for the 4-point score. The novel 4-point CTA score appears more sensitive (85.7%) and requires analysis of only 4 vessels. Whereas the cortical segments of the MCAs were assessable in all previous studies,11,12 the excluded cerebral veins were deemed difficult to assess because of cerebral hemorrhage or edema. Strict comparison of unenhanced and enhanced images, additional sagittal and axial subtractions, is helpful for confirming lack of opacification. CTA remains a 100% specific method as shown by the 10 conventional angiographies and 12 EEGs performed when the CTA score was <7. An increase in intracranial pressure (ICP), leading to cerebral circulation arrest, is a major consideration. CTA, given its high sensitivity for vessel visualization, does not appear to be efficient for patients with craniotomy, as previously reported, with intravenous angiography leading to false-negative results.14 To avoid repetitive examinations, we recommend an interval of >6 hours before CTA, particularly in cases of anoxia, because of progressive increase of ICP. In the present study, data on the interval between clinical BD diagnosis and the first CTA were missing due to logistic problems, so we could not evaluate the potential statistical difference between the score and interval. Ancillary confirmatory testing practices vary worldwide. In the United States, for example, EEG is performed in 84% of main neurologic hospitals; conventional angiography, in 74%; and CTA, in only 6%.22 The main advantages of CTA are that it is a highly sensitive imaging examination with an operator-independent standard protocol, has a simplified score, and has greater accessibility. Moreover, CT is not limited to brain: The whole body can be examined simultaneously. Indeed, chest, abdominal, and pelvic examinations are now routinely integrated in our CT protocol for assessing BD. This additional information provides further insights into organ vasculature and abnormalities before harvesting. The novel 4-point CTA score based on nonopacification of the cortical segments of the MCAs and the ICVs appears highly sensitive for confirming brain death, maintaining a specificity of 100%. Absence of opacification of ICVs is the most sensitive sign. Compared with other ancillary tests for BD, CTA is reliable, standardized, and widely accessible and can examine the whole body, making it particularly useful in cases in which there is a potential for organ harvesting. We thank all members of the CTA Group for BD: Drs E. Bironneau, F. Buzy, J.-C. Combes, J. Duranteau, Y. Menu, D. Perrin-Gachadoat, and C. Quintin; all members of the organ harvesting teams; and Kudzaishe Takavarasha for his help in English. This study was approved and supported by the Agence Française de Biomédecine (French Agency of Biomedicine). Decree No. 96–1401 of December 2, 1996 concerning brain death diagnosis, organ, tissue, and cell harvesting for therapeutic or scientific uses and Circular D.G.S No. 96–733 of December 4, 1996. Official Journal of the French Republic; 1996. Accepted after revision March 9, 2009.